After announcing layoffs this January, EQT, the largest natural gas producer in the U.S., also promised to decrease spending by 20 percent in 2019. However, much like giving mortgages to people without jobs wasn’t a sustainable business model, loaning money to shale companies that spend it all without making a profit is not sustainable. Wall Street investors are now worried about getting paid back, and interest rates are rising for shale companies to the point that borrowing more money is too financially risky for them. And because they aren’t earning more money than they spend, these companies need to cut spending. With many fracking companies failing to meet their production forecasts, as The Wall Street Journal has reported, investors may have good reason to be fearful. The days of unlimited low-interest loans for an industry on a decade-long losing streak might be coming to an end. Prospects for natural gas don’t look much better north of the U.S. border. Like the Canadian tar sands oil market, the Canadian natural gas market is also in the midst of a long losing streak. The problems facing the natural gas market in Alberta, Canada, is “far worse than it is for oil,” said Samir Kayande, director at RS Energy, according to Oilprice.com. Canadian natural gas producers are being crushed by the free-spending American companies that could produce records amounts of gas at a loss while using borrowed money. One reason natural gas is so cheap right now is that fracking for oil in the U.S. ends up producing huge amounts of gas at the same time. This gas that comes out of the wells with the oil is known as “associated gas.” And it is so plentiful that in places like the Permian Basin in Texas, the price of natural gas has actually gone negative. Paying someone to take the product that a company spent money to produce is not a sustainable business model. 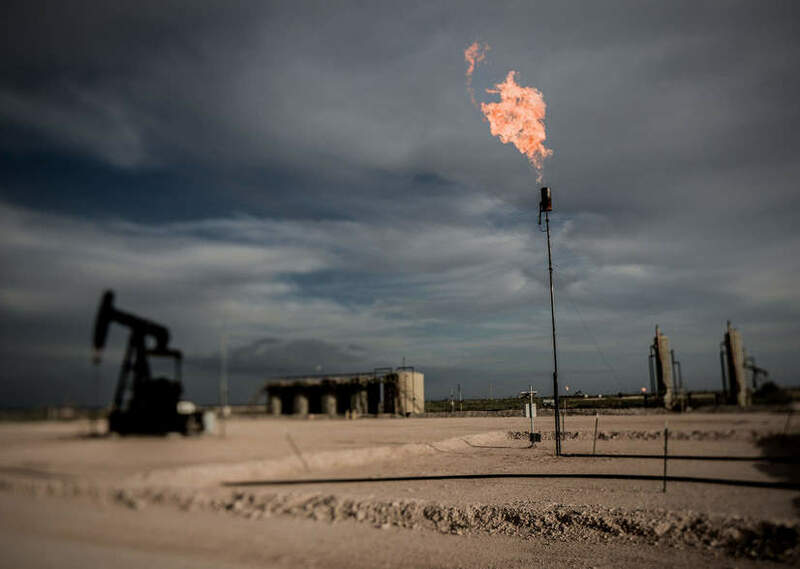 Additionally, the U.S. oil and gas industry chooses to flare large amounts of natural gas in oil fields because it’s cheaper than building the necessary infrastructure to capture it — literally burning its own product instead of selling it. And the Canadian producers, who used to sell gas to the U.S. market, simply can’t compete. Too much supply, not enough demand. To remedy this problem, the report recommended expanding supply, decreasing regulation, and bailing out companies with financial backing from the government, with the ultimate goal of producing more gas and exporting it to Asia. With Alberta’s reliance on oil and gas to support its economy, it is easy to see why its politicians are loathe to recognize the economic realities of the natural gas (and tar sands oil) industries. However, some politicians feel the same way about the American coal industry, and that is dying primarily because renewables and natural gas are cheaper ways to produce electricity. Chesapeake Energy is often held up as a case study for the fracking boom. It was a huge early financial success story (based on its stock price, not actual profits), and in 2008, its then-CEO Aubrey McClendon, known as the “Shale King,” was the highest paid Fortune 500 CEO in America. Since those high times, it has been a rough decade for Chesapeake. The stock price is near all-time lows — where it has remained for years. Chesapeake has stayed afloat by borrowing cash and currently owes around $10 billion in debt. Unable to make money fracking gas in America since the days of the Shale King, Chesapeake has a new strategy — fracking for oil. One of the top gas producers in America and a “fracking pioneer” is abandoning fracked gas as a path to a profitable future. The fact that Chesapeake now believes fracking for oil is a path to a profitable future — despite all the evidence to the contrary — gives this move an air of desperation. While U.S. politicians from both parties have given standing ovations for the U.S. oil and gas industry, investors appear to be losing their enthusiasm. The so-called shale revolution, the fracking miracle, may have resulted in record oil and gas production in North America, but the real miracle — in which shale companies make money fracking that oil and gas — has yet to occur. The North American natural gas industry is facing a crisis with an oversupplied market and producers that are losing money. Those producers desperately need higher natural gas prices. However, higher gas prices mean renewables become even more attractive to investors, which may lead to gas following in the footsteps of coal — dying at the hands of the free market.